This page details the use of Epson InkJet printers with pigment based inks to feed and directly print resist patterns to copper clad printed circuit board stock, ready for etching. Once you can feed the PCB through the printer for etch resist, you can then feed it back through the printer for solder mask (yes! Several people report that it works quite well!) and for a component "silk-screen". Toner transfer is probably easier to set up for and may be as fast, but direct ink is more precise, allows solder mask and component printing in the appropriate color, and most importantly, finer traces and spaces! And if you admit that a laminator is required for TT, given the prices for old C84^ or R220^ / R280^ printers and the Inks, direct to PCB InkJet printing is cheaper. Photoresist systems do allow finer boards, but equipement and materials costs, as well as time are substantial. Barry Cooper^ reports^ that Epson ultra chrome k3 ink in his Epson R2400 printer also resists etchant if fully cured. Also, the R2400 can print on flat stock so no modification of the printer is required. Even without an inkjet ink that will stand up to echant, you can print with an inkjet and then dust the wet ink with toner in a hybrid of inkjet and toner transfer. This guide was written by Stefan Trethan and edited with comments added from Volkan Sahin (Volkan not Volan, Voltan, Votan, etc...) who first developed and shared this method on the Homebrew PCB Yahoo Group^. 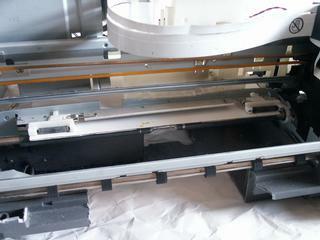 A new group InkJet PCB Construction^ has been formed for more specific discussion. These pictures show a typical modified printer, a PCB blank being printed, and the sort of results some people are getting. That is a TSSOP chip! "I am currently using 1/16" [PCB stock]. I made a carrier from a for sale sign and a sheet of the colored plastic card that is kept right next to the for sale signs at home depot. The 2 together add up to 1/16 inch. They are plastic and are therefor durable and can be taped to, and the tape removed without damage. I printed on to paper first, then taped the 2 plastic cards together with the paper print on top. Then I cut out the card to the dimensions of the paper and cut the board hole out. Then I pulled of the paper print and taped all 8 edges together, then a piece of paper to the bottom of the card. I am able to drop the board into the hole and it indexes perfectly every time. I use a small piece of tape to hold the top and bottom edge of the board, The carrier fits through the printer with room to spare. My guess is I could go another 1/32 thicker.Last night I printed in black at only 25% density. Dried the board at 275 degrees for 10 mins then re printed at the same density. Flipped the board and did the same for the other side then oven dried the complete board for 30 mins at 275, It is necessary to let the board cool before re printing as at 275 the ink is like a soft plastic. I then etched with acid and had a fantastic result. Bazza says "Epson R2400 takes a board up to a4 size straight into it. Print in black and white at 50% Then oven dry at 275 for 10 mins. then re print at 50% and re oven dry, perfect results with zero mods required." CD/DVD printing trays. (make small PCB's with NO modification!) Artisan 50, Stylus RX580, RX595, RX680, R260, R280, R285, R290, R380 don't really need to be modified, just cut out the CD/DVD spindel in the tray so the PCB can lie flat. This allows PCB's up to about 3x5". CX4200 by Volkan Sahin. 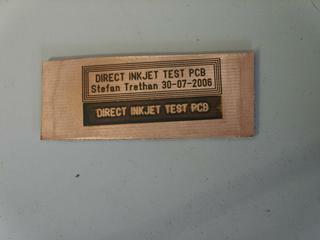 Volkan has also produced a custom flatbed inkjet direct PCB resist printer of his own design, using the heads from an Epson Inkjet. Sand the PCB with 600 or 1000 grit paper so that the surface appears scratched everywhere. 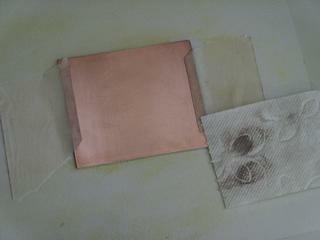 You may also use a abrasive plastic pad sold for cleaning copper pipes before soldering. Then wipe with acetone, twice, the first pass should take away the copper dust. The PCB must be grease free now and stay that way. Bora Dikmen says: "...before printing, you should bath the PCB about 1-2 minutes in acid (H-Cl + H2-O2) to become purple-brown in color. This creates a soft surface and ink will be printed very smoothly as if it is printed onto a paper. Otherwise, ink is populated on some areas, waved in color and not evenly distributed on the PCB." Volkan found that wiping the PCB with DOT 3 brake fluid helped to keep the surface from corroding before it could be printed after cleaning. It was also found by others to help reduce the puddling of the inks.^ Volkan Sahin says "I saw some puddling when the board is not clean enough and to avoid it I used wetting agent. I just did a few tests it worked for me. I used automobile [DOT 3 brake] fluid as a wetting agent. 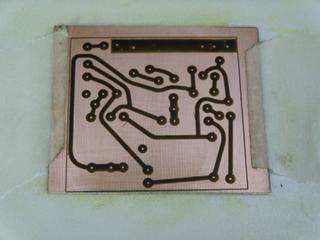 Coat cleaned pcb with very thin film of fluid and wipe it several times completely with paper towel. Set printer to minimum ink amount and then print." Later he found a better treatment: "I found two methods to avoid it one of them was using brake fluid and the other one is coating board with very thin layer of gelatine (unflavored one) before printing. I saw that gelatine is working much better than brake fluid. I used Knox brand. Use 1/2 cup boiling water and one bag (~7grams) of gelatine, let it become cool a little bit and apply it using paper towel on a clean copper clad and dry it. It should be thin layer otherwise during curing it can cause cracks on traces." 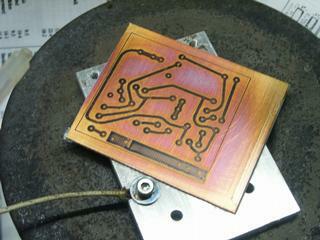 John Mardock says "... tried the MIS yellow (MP-4-Y) we have been using with the heated board with good results. I made a series of 5 boards using this yellow from 75C to 105C all with about the same success. 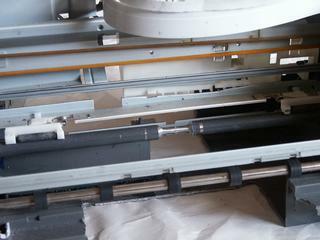 The boards are heated in the oven for several minutes to stabilize the temp and then removed and positioned in the printer. I am sure there is heat loss during the process. The great news is this board heating does handle the puddling effect that has been such a pain. The dry time for the ink is just about instantaneous on the heated boards as you might imagine. Seemed the higher the heat the better the coating of the ink. ... The other interesting aspect was one of better resist with less ink being deposited on the board." When printing a purely black test pattern I found the transparency setting does not use any ink from the black cart at all. The other settings use ink in varying amounts, the most ink is used for matte paper and the least for glossy or durabright setting. You need Photo or Best Photo resolution. The "fast" setting, which prints in both directions of travel, produces better results for me. No edge smoothing needed. Some printers / drivers / printing applications will, even when told to print grey or black and white only, mix in colors from all the ink cartridges to make a "mixed" black. This can dilute the special ink if it is only in one cartridge. Most windows printer drivers also increase the width of the printed lines to improve reliability. The "gutenprint" drivers seem to be able to support finer resolutions of print. They can also avoid mixing ink, and can be modified to print over the hole in a CD Tray. Bob Drings ^ work with this driver is amazing. option for mirror imaging (left/right). option for reverse imaging (positive/negative). option to select which ink(s) to use (yes, c+y+m+k is possible, if your film can handle that much ink). options for fast draft and quality draft on plain paper. options to position the print on the film. always uses full coverage (100% drops) regardless of ink choices. weave algorithm chosen for accuracy, not color quality. includes compile-time options to adjust the registration between ink nozzles. Bob Dring ^ is working to document the ESC commands that are actually sent to the printer and has written a program^ that decodes, and can modify them to better control cartridge selection. This video shows how to use a modified C87 to print and etch a PCB. When printing, keep in mind that the printers / software may not produce a printout that is /exactly/ the correct size. The traces may be "stretched" or warped in the x or y axis. It's good to have a PCB program that allows fine scaling of the printed size in either dimension. The alignment of the printer can also be adjusted by a competent service tech. To print you must insert the carrier manually into the printer. Turn the printer on, and wait until it has completed it's dance. Now feed the edge of the carrier into the printer so that it just protrudes a few mm from the traction/pressure rollers. Make sure it is straight so it will not run against an edge when the printer feeds. Now print the artwork on your carrier to find the right position (stick some tape or adhesive backed plastic foil on it or you may end up with permanent marking of the carrier). You can use low resolution for this print since you only need to know where it will end up. If you use the fastest draft setting watch out, the printer virtually shoots it through. Now place the PCB over this position and stick it down with tape along the edges (take care not to cover any holes, the printer may look for those for alignment) or using double sided tape underneath. You may delay the acetone cleaning of the PCB until this point if you prefer. Again feed the carrier and print the artwork. If you choose to try the hybrid ink/toner method, dust the wet ink with laser toner or embossing powder at this point. This is a key step. 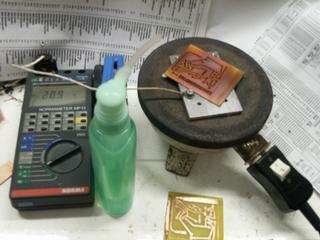 The PCB and ink must be heated to a specific temperature to cure it and keep it from coming off in the etchant. To do this, a stove or heat gun will not allow the required temperature control. Something more precise must be used: Basically an old electric hot plate with a aluminum plate on top and a temperature meter attached. For MISPRO Inks: It turns out that around 446F / 230C is the sweet spot. keep that for several minutes (at least 3 i'd say for now but more research needed). This incidentally is exactly the point where the copper will start to go from just minimal yellowish oxidation to a purple one (This is probably what Volkan is using to judge the temperature). It is well away from damaging the PCB.If you are much below or above this temperature the ink will not resist so well. Round about 225C the ink starts to change somehow and can no longer be cleaned off, even with acetone. For Hybrid Ink/Toner: Use the temperature at which the toner or embossing powder melts. It will be very easy to see, as the powder will suddenly become shiny. suspected Ferric chloride is less aggressive to the [MSPRO] ink than CuCl, so i set up a test. 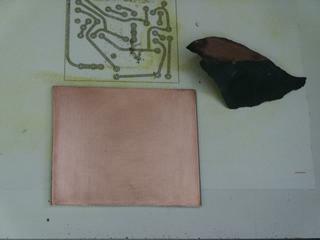 I cut a test PCB in half after curing to get identical samples, and put one in CuCl and one in ferric chloride. If anything the ferric chloride showed more aggressive under-etching. In the samples below, the lines above 3 mills are fine; below 3 they are unreliable.